Book Review: “Good News for Women” by Rebecca Groothuis | J.W. Wartick -"Always Have a Reason"
The debate over women’s roles in the home and in the church rages on. A large part of the debate has focused upon the Bible verses that either side raises in defense of their view. Little of the debate has focused on the philosophical implications of either position. Rebecca Groothuis’ Good News for Women offers a different approach. Groothuis integrates extensive philosophical arguments into her Biblical case for the egalitarian position. [T]he strategy of the New Testament church was to tolerate the social subordination of slaves and women so as not to risk alienating non-Christians from the gospel, and yet to modulate and moderate these customs, and ultimately to point beyond them to God’s original intention for human relations. Today, however, when non-Christians are not likely to be offended by an equalitarian gospel, but are likely to find a hierarchical gospel offensive, we have no reason to perpetuate the cultural practices that were intially intended for Christians living in patriarchal societies (25). Groothuis concludes that throughout the Bible, there is a pattern in which male and female are equal in being. They are, in other words, ontologically equal. Neither is more valuable than the other. It should be noted that most complementarians today are willing to grant this case. They agree that women and men are indeed created equal and should have equal rights. Groothuis then turns to a series of philosophical arguments which seek to demonstrate that the complementarian position cannot consistently hold that women are equal to men while holding that they are excluded from the ministry. Her argument, therefore, goes deeper than an exegetical challenge. Instead, her argument undermines the theological core groundings of complementarianism. Grothuis continues with extensive argument to rebut the notion of servant leadership (78ff). She also deals with various analogies complementarians use to attempt to ground equality and hierarchy, such as the Trinity (55ff–it should be noted that grounding subordination in the Trinity undermines the doctrine of the Godhead). It should become immediately apparent as to how this leads to a problem for complementarians. Biblically, they are forced to concede that women and men are, in fact, equal. However, their position undermines this Biblical position of the equality of men and women. Therefore, it seems their position fails. Groothuis also spends some time dealing with some of the odd–and frankly, pagan–ideas used by some complementarians. For example, some argue that God must act as a male in the creation event: one who gives so much, while the created world merely receives. To be blunt, they describe God’s creative act as a sexual act, with no Biblical support. Groothuis rightly points out that this idea is little more than paganism dressed up in theism, but goes on to note that “It seems a good deal of imagination and determination is required in order to characterize the strenuous effort required of a woman’s body in nourishing, growing, and delivering a child as ‘overwhelmingly passive,’ while depicting the male role of standing around watching it happen as ‘active’!” (95). Another abuse of gender in the Godhead involves some complementarians arguing that because Jesus was a man, only men can be priests (109ff). Groothuis points out that “If we are to regard maleness as essential to who Christ is as Christ, not only must we question whether Jesus Christ can represent women as fully as he can men… we must also view women as essentially inferior to men. Women lack the Christlike attribute of maleness that renders men best qualified to represent Christ…” (113). Interestingly, then, complementarians who utilize this argument essentially undermine the doctrine of the atonement: for Christ’s maleness is emphasized to the point that Jesus is not an adequate representation of humanity. He is essentially male. 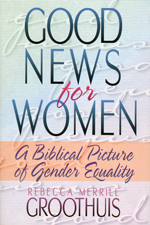 The second half of Good News for Women focuses upon an evaluation of the texts used to support complementarianism. These texts are examined in light of the theological points already established. Namely, women and men are created equally as imagers/likenesses of God; and that any attempt to ground hierarchy ultimate fails because it undermines this Biblical concept of equality. A full presentation of Groothuis’ analysis of these texts would probably triple the length of this review, and I don’t see any way to sum up these arguments adequately in a few sentences, so I unfortunately must leave it to those interested to read the book to see these analyses. Finally, it would be remiss to go without mentioning the outstanding contribution Groothuis gives to the discussion of egalitarian marriage. Groothuis discusses marriage in detail for over 40 pages of the book. What is astonishing is how lucidly she lays out the principles of egalitarian marriage. She illustrates the nature of marriage and how it is a give-and-take with both persons involved as opposed to one ruling over the other. She also discusses in detail how such an egalitarian system can work without having anyone to have a vote to “trump” the other’s vote. Frankly, the book is worth reading just for her discussion on marriage. Groothuis’ most important contribution here is in the first part of her book, which establishes a strong theological and philosophical case for the equality of men and women in teaching roles in the Church and equal roles in marriage. However, there are numerous important insights throughout the text, both into specific verses and into overarching themes in the debate from both the complementarian and egalitarian positions. Groothuis’ discussion of egalitarian marriage provides a way forward for discussion on the roles of men and women in marriage and also helps to give insight into the Biblical view of marriage. Overall Good News for Women presents a strong philosophical critique of complementarianism which people on both sides of the debate must consider. I have read many articles and books on this topic, and frankly I have yet to find a book which goes into the ultimate philosophical and theological implications of complementarianism as thoroughly as this book. I recommend it extremely highly. See my other writings on egalitarianism on my theology page (scroll to the bottom). I argue that certain complementarian arguments undermine the Trinity. I review a book which focuses entirely upon exegetical issues related to egalitarianism: Man and Woman: One in Christ. Rebecca Groothuis, Good News for Women (Grand Rapids, MI: Baker, 1997). Funny you should post this as I just read this rather provocative (and interesting) article yesterday on Mark Driscoll’s Seattle megachurch Mars Hill. Driscoll seems to embrace an almost pre-Calvin Calvinism, if you will. A regressive Calvinism that, for whatever reason, is wildly popular and growing. Of course, they fully embrace the complementarian role for women you evidently reject. I am curious of your opinion on two fronts: first, why is his approach so appealing? It seem like a left-field type of approach to Christianity that would be considered fringe if 15k people weren’t attending weekly. Second, what is your opinion on the Driscoll’s (and other’s) attempt to make Christianity more “hip” and palatable while also preaching strict doctrine? Is this a sustainable plan for Christianity at large? Those are some very wide-ranging questions, so I don’t think I could adequately respond to them. In particular, I don’t know enough about Driscoll’s brand of Calvinism to comment with any kind of meaning on it. So I don’t know why his approach is so appealing. I have watched a few videos of him and have to say they make my stomach churn. Complementarianism is still a very strong position within the church. The arguments in its favor are very strong. I do not find them convincing, however, in light of the case for egalitarianism. I think egalitarianism makes better sense of the whole of Scripture’s teaching. Again, it is hard for me to know what I think of Driscoll’s attempt to make Christianity ‘hip’ while preaching strict doctrine. I’m pretty unfamiliar with his approach and anything I’ve seen from him has caused revulsion in me. It would be impossible for me to comment without being completely speculative, so I’ll be supremely unhelpful and just say I don’t know. Thank you for your review of this book. Have you read “Women Caught in the Conflict” yet? This was Becky’s first book. I highly recommend it. It is important to stress the importing of hierarchy by way of the Trinity; I agree, that this is a heterodox view of the Godhead, and I have listened to sermons which taught the eternal subjugation of the Son to the Father in order to justify women’s subjugation to men. But I have found many women who actually like the idea of passivity and submission in a marriage: because it is the easy way out. If a woman just is obedient, she is freed from a lot of responsibility in the relationship, and if her husband makes a mistake in judgment, he bears all the burden of the mistake. Personally, I have found that trying to be obedient and submissive in a marriage never works, and I know other Christian women who tried this type of behavior in their marriages at first…and they discovered the same thing.